Moms are full of wisdom, and their adages, warnings and tips stick with us through the years. Here are 10 important lessons that moms teach their kids. Yes, honesty is a good thing — but when that honesty is unsolicited and hurtful, it becomes something else. Be mindful of other people’s feelings. Good dental hygiene helps your teeth — as well as the rest of your body — stay healthy. So heed your inner Mom voice and brush twice a day. Eat your fruits & veggies. Fruits and veggies are rich in nutrients and fill you up with natural fiber. The more of them you eat, the healthier you will be. If you make the mess, clean it up. If you take it out, put it back. Honestly, a really, truly messy home is a huge turnoff. Good old-fashioned manners never, ever go out of style. We mean it. Politeness endears you with people everywhere. I’ll be the first to admit that I never thought that the people I knew when I was younger would make any difference in my adult life. Then, Twitter, Facebook and blogs changed everything. Today’s world is smaller than ever. Social networking now makes running into people from your youth far more common than it used to be. Recycling is more important than ever. Sending perfectly reusable trash, such as bottles and discarded paper, to the dump makes the planet dirty and less usable. 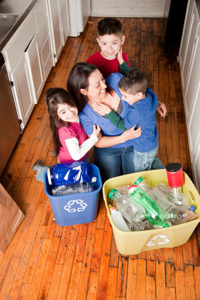 Instead of wasting these things, reduce what you use and recycle what you can. Part of being less wasteful is not allowing yourself to have too much stuff. So, when something new comes home (like a gifted toy), have the kids select a still-working one to give to someone else. This sort of generosity is an important lesson for kids. Remember when Mom said, “You catch more bees with honey than you do with vinegar?” Being sweet to people and speaking nicely are more likely to get you good results (whether it’s an easy time shipping packages or a hassle-free return). Anyone can tell when you aren’t being genuine, and fakeness just isn’t attractive. Being yourself is a far better idea. Everyone wants you — not some facsimile.